I’ve been meaning to share this upcycling project with you guys since last spring. For one reason or another, this project never made it to my publishing schedule. With spring and summer being big months for most people to visit flea markets and garage sales, I hope this post sparks some inspiration as you guys peruse through hidden treasures. Besides garage sales, you can always count on local flea markets (search here) and Craiglist to scout items out. I found this chair while walking through a flea market one day. It caught my eye because of the handle in the middle, its low back shape, and the fact that it was…..$Five Dollars! Yes, it was practically given to me for free. For $5.00, I was definitely willing to give new life to this lonely chair. 1. Gorilla Glue – If parts of your chair seem to be loose, I suggest securing them together first before doing anything else. 2. 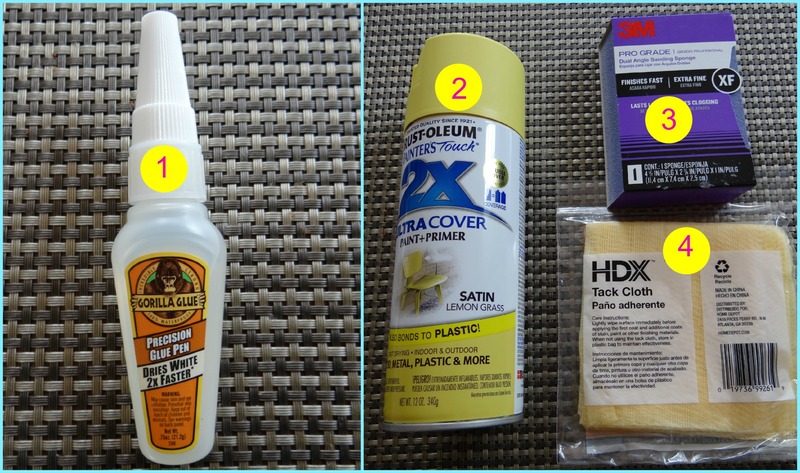 Spray Paint – I chose a Paint+Primer spray paint by Rust-oleum. For my chair, I used almost 2 cans of paint. 3. Sanding Sponge – If you have an electric sander, by all means use it. I thought I’d wing it with a sanding sponge first. It actually turned out fine. 4. Tack Cloth – This is a great item to have for any furniture sanding job. The cloth is sticky so all the sandy residue will adhere to the cloth. You’d want to get rid of all the residue before spraying your chair. 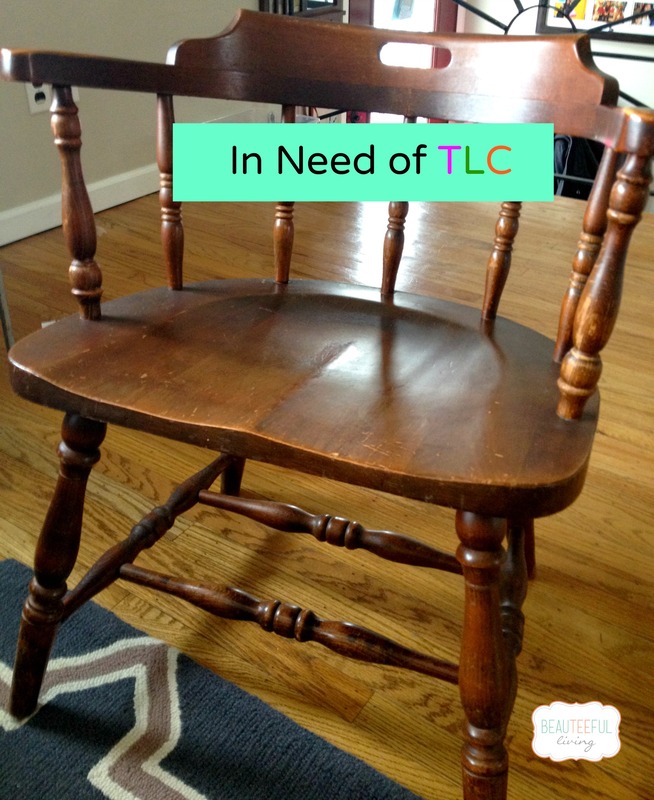 1) After securing loose parts with glue, bring chair to a well-ventilated area. I picked the most inconspicuous spot in our backyard for this project. 2) Sand chair until you’ve removed a thin layer of the old surface. The spindles will take the longest. 3) Use tack cloth to remove all residue from sanding process. 4) Let the spraying begin! Be sure to do this in a well ventilated area. You should also be wearing a sanding/painting respirator. Note: You should keep 6 – 8 inches from chair when you spray, moving back and forth quickly and spraying it from all angles. Apply 2-3 very light coats of spray paint. If you apply the paint too heavy, it will have “drip” marks. Allow each coat to completely dry in between, otherwise the paint will bubble. 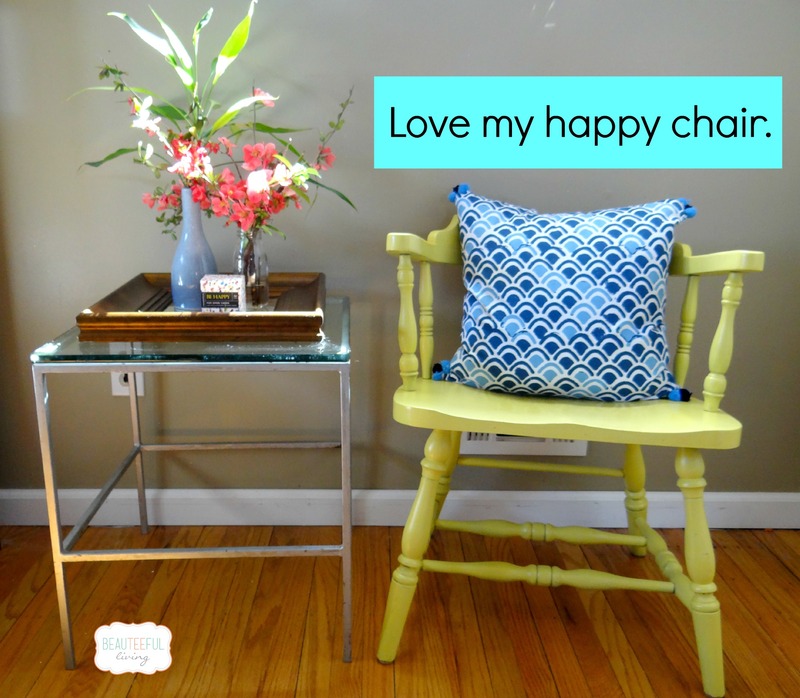 Here’s how the chair looks in our living room after its much-needed face-lift. 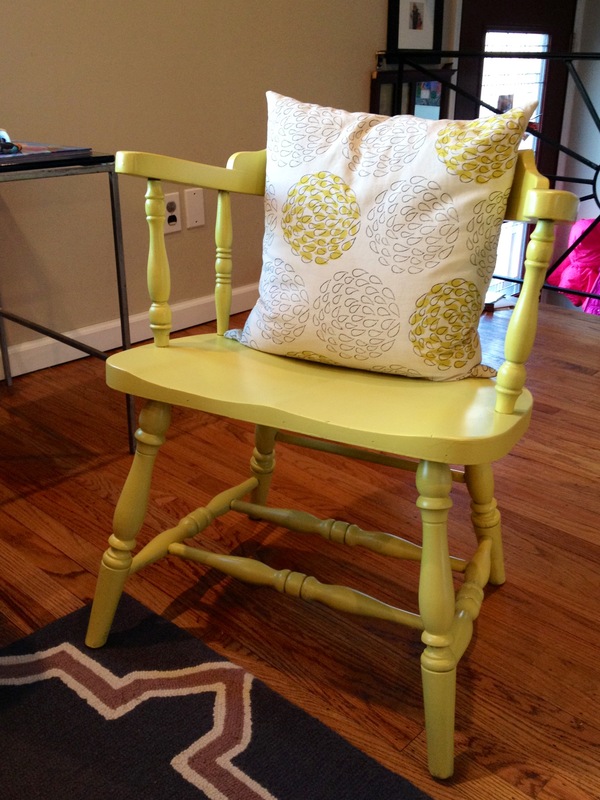 I love the color yellow and it seems to be the perfect color for this newly “upcycled” chair. If you’ve enjoyed this post, please like, share, or pin this project. 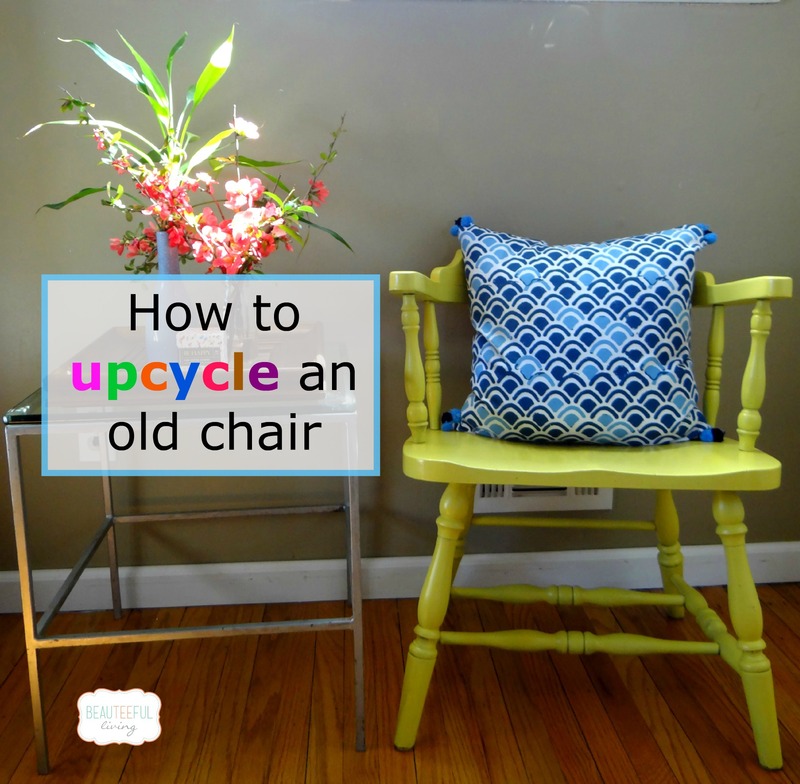 I look forward to sharing more upcycling projects like this on Beauteeful Living! I’d love to hear your thoughts on this project. What color would you have painted it? As always, thanks for reading! Xoxo, Tee. Love love it! I have a chair EXACTLY like it that I bought for $5 too! Thank you for the inspiration! I love the color you chose! And your throw pillows are SO great! I would like to feature you tomorrow for the Feature Friday link party you linked to this week. I don’t see a link back on your post–if I’m missing it will you let me know? 🙂 Thanks! Hi Brooke, I contacted you via email. 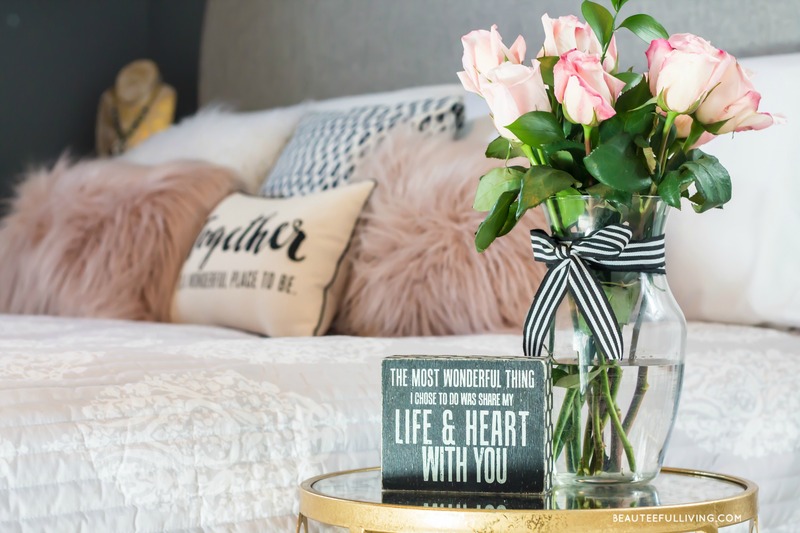 Thanks so much for featuring this project in tomorrow’s post! Your new chair looks very pretty! I love the yellow! One of my favorite colors — especially for decorating the home! I love that! Yellow is such a great and happy color. I have a few furniture pieces I need to upcycle too. Thanks, Miranda. Glad you like the color :). The chair looks so pretty now. I like the color and it turned out very well. I think you have great talent in up-cycling. Will have to try this transformation idea for old furnitures in my home. Thanks for sharing your idea. I am loving what you did to this chair! I have a similar one that I now want to makeover! You should do it, Carly! Thanks for commenting. Awww! that looks beautiful and so summery looking chair. You did an amazing job. Love, love, love the color!!! Great job. Thanks, Dianne! There’s definitely a lot of yellow decor items in my house as well as this chair. Super cute! I love the pillow too. I love the yellow! So welcoming and cheery! I love the color you picked out and the matching fabric! I love giving old furniture new life. My grandmother had chairs exactly like this! I wish that I was in my home that I am in now when she passed away because I would’ve jumped on the chance to take something like those chairs but we were in a tiny house. Great upcycle project and I LOVE the color!! Such a cute upcycle. That would be an upcycle that I like. Love it! You have an eye for things that can be revived! I would not even have considered the old chair had I seen it! Thanks, Angela! The great thing is the kids were with me when I bought it and still remembers how this chair was transformed :). now, that’s pretty nifty! I love how it turned out. You did a really great job on this chair! I love the yellow color you chose and how low cost this project is! The chair looks amazing and I’m loving the pillows. You’ve really got a talent for upcycling! Pinning this one too! Thanks so much, Yanique! Glad you found this post helpful. 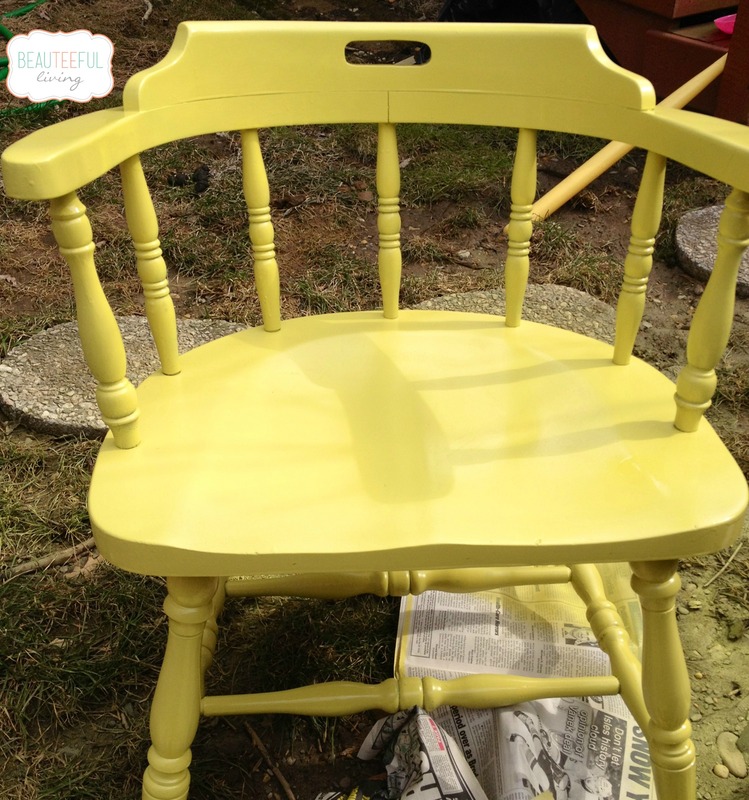 It is amazing what you can do by upcycling old furniture. I have a few of these old kitchen table chairs (they look very similair to the one you started with) and I would love to give them new life. Yours can out spectacular! I love the fresh, summer color! That was a great transformation. I need to start Upcycling some of my old furniture. love it. i would have totally passed it by. Thanks, Michele! Yes, the gorilla glue worked well with this project. Good luck with yours! Can’t wait to see how they turn out!